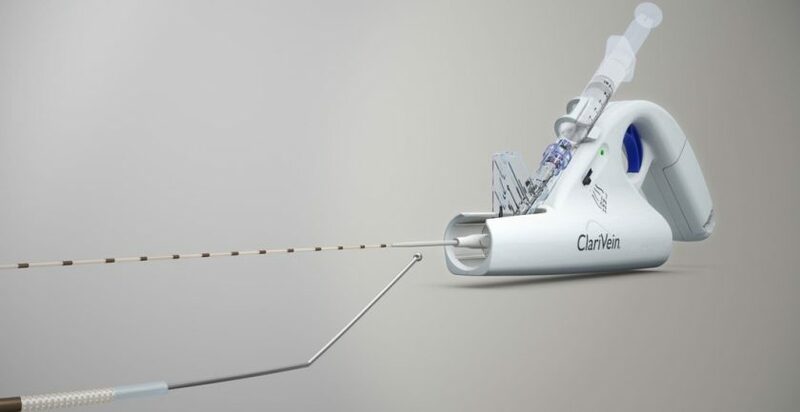 Clarivein is a new way to treat varicose veins without anaesthetic. It was invented by Dr. Michael Tal. Before 1999, varicose veins were stripped out. Research from The Whiteley Clinic has shown that stripping leads to a high recurrence rate. Since 1999, leading vein experts have used endovenous surgery techniques. The two most common are radiofrequency ablation and endovenous laser ablation. Both of these use heat to destroy the vein. Therefore they need local anaesthetic to be injected around the vein during treatment. This local anaesthetic is called “tumescence”. Clarivein is one of the new endovenous techniques that is tumescence free. Because it does not use heat, it does not need any local anaesthetic injected around the vein. What is mechanochemical ablation (MOCA)? Mechanochemical ablation (MOCA) means ablation of the vein, using combined mechanical trauma and sclerotherapy. In varicose veins, the vein causing the underlying problem has to be permanently destroyed. Ablation is this permanent destruction of the vein. Clarivein is a mechanochemical ablation technique. Why would we ablate varicose veins? Research from The Whiteley Clinic has shown that stripping veins away often results in the varicose veins growing back again in the future. However, veins destroyed by ablation do not come back. A vein that is “ablated” is destroyed within the body. The body then removes the dead vein. Provided the principles of The Whiteley Protocol are followed, this results in the vein being permanently removed and not regrowing. Failure to perform satisfactory ablation means the same varicose vein can open up again causing recurrence. Clarivein uses mechanochemical ablation techniques. The surgeon passes the Clarivein catheter up inside the vein. Ultrasound guides the position980987. Thus it is an endovenous technique-literally treating the veins from inside. When the catheter is in the correct position, the surgeon opens the Clarivein catheter. At this point, a special wire tip protrudes from the end of the catheter. Using ultrasound, the doctor positions the tip at exactly the right point to start treatment. The doctor then pulls a trigger. This starts the wire tip rotating at approximately 3000 revolutions per minute. Research from The Whiteley Clinic has shown that this rotation damages the vein wall. Although many people used to think it only damage the inner part of the vein wall, our research has actually shown the damage occurs deep within the muscle layer of the vein wall. As the wire rotates, the doctor injects sclerotherapy solution through the catheter. Although sclerotherapy and foam sclerotherapy does not work very well in veins with thick walls, the mechanical damage allows the sclerotherapy to be much more effective. Indeed, our research suggests that it turns the vein wall into a “Swiss cheese”. The mechanical rotation of the wire makes small “tunnels” by ripping the vein wall. Sclerosant flows into the wall through these, causing permanent ablation. Clarivein is very useful for patients who do not like injections. As a tumescence free procedure, there is no need to inject local anaesthetic all the way along the vein. Therefore this reduces the discomfort of endovenous surgery. Furthermore, reducing the need for injecting tumescent anaesthesia also reduces the time taken to perform the procedure. In addition, Clarivein is safe when used in veins low down in the leg. As Clarivein does not use heat, it can be used in veins that are right next to big nerves without putting the nerves at risk. Laser and radiofrequency use heat. Therefore, it is too risky to use these techniques in these veins. What are the advantages of Clarivein? Are there any drawbacks to using Clarivein? Clarivein has many advantages in suitable patients. However, there are some situations where it would not be recommended. The rotation of the wire has a set maximum diameter. Therefore, Clarivein is not recommended for use in very large veins. As Clarivein uses sclerotherapy solution, it cannot be used in patients who are allergic to Sclerosants. Fortunately, this is very uncommon. It also has to be used with caution if too many veins need treatment as there is a maximum dose of sclerotherapy solution that can be given at any one time. Currently, patients with incompetent perforating veins are probably unsuitable for treatment with Clarivein. However, there is a recent report on the treatment of perforators with Clarivein. The treatment of perforators might be possible in the future. 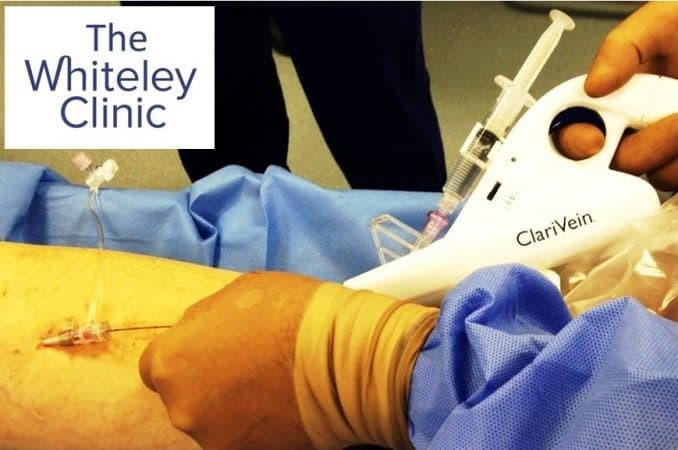 If you want to discuss having Clarivein treatment, your Whiteley Clinic consultant will be more than happy to go through the options with you.